UPDATE, 2012: Sadly, it seems Nancy's Fancy may no longer be in production. In tribute to a fantastic product and an amazing effort, Savoring Kentucky leaves this post in place. I have tried. I really have. I have tried perhaps five different recipes for making those crunchy, savory, cheese-y crackers that call to us from holiday tables and Bluegrass family gatherings. The good ones -- homemade, by someone who has both a good recipe and a good touch with pastry -- come with little edible embedded microchips that radio a steady signal impossible to deny: "Eat me and be happy. Eat me and touch the stars. Eat me and find out the answer to life's mysteries." 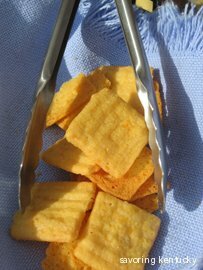 In other words, a perfectly made, crisp, homemade cheddar cracker exerts a powerful pull on the awareness of many of us who have had the good fortune to eat a superb version somewhere, sometime. I'm always surprised when a retail food tops a homemade food in taste and quality. Nancy's Fancy Cheddar Snaps top any cheddar cracker I have attempted, while making crackers altogether more interesting with the "little kick" of cayenne promised on the box. Unlike Betty Crocker -- or the Pillsbury Doughboy -- Nancy Talbott, co-founder of Nancy's Fancy, lives and breathes, and plenty of people will vouch for her penchant for making fine cheddar crackers across a few decades. I enjoyed Beverly Fortune's story in the Lexington Herald-Leader about how Nancy and her daughter, Linda Barnes, sought and received a great deal of problem-solving and guidance as they built an artisanal, Kentucky Proud food production company based on a family recipe and a commitment to quality. Forehead relaxes as the crunch manifests right in the first bite. Grin begins as the cheese-butter flavor appears. Big open 'Wow' eyes when the 'little kick' of cayenne makes its belated but appropriately showy entrance. The ingredients help explain the quality: Extra Sharp Cheddar Cheese, Unbleached and Unbromated Wheat Flour, Butter, Baking Powder, Salt, Cayenne Pepper, Rosemary Extract. I must report, though, that I have made cheddar crackers with pretty much these same fine ingredients. I ended up with either (1) bricks, or (2) greasy crumbles. So part of the magic at Nancy's is that Nancy and Linda know what to do with the good ingredients they have chosen. Nancy's Fancy Cheddar Snaps are available online with free home delivery to the lucky people who live in Lexington. Quite a few retail locations now carry the Snaps. Check the cheese section at Good Foods Coop, where the crackers "fly off the shelf," says an employee. Lexington Liquor Barn locations have them, although a Hamburg store staffer says they run out weekly, so call before you make a special trip. Either that, or turn on your little Cheddar Snap radio receiver, and the beeps you hear should lead you directly to the closest stash. The world is coming to visit central Kentucky this year for the Alltech FEI World Equestrian Games. To help our visitors know more about Kentucky's food and food ways, Savoring Kentucky is rolling out 116 Savory Kentucky Bites, one for each of the 100 days before WEG begins, and 16 for the days during WEG, September 25 - October 10. Today's Savory Bite is number 46.